Are you ready to join your new job? Well, while joining a company it is necessary to submit all types of certificates and experience records to your employer. It is also required to submit your health examination certificate. How are you going to make that? Well, there are several types of Examination Forms as templates available in our collection in Internal Link Anchor Text format. The health examination form template options are as follows. 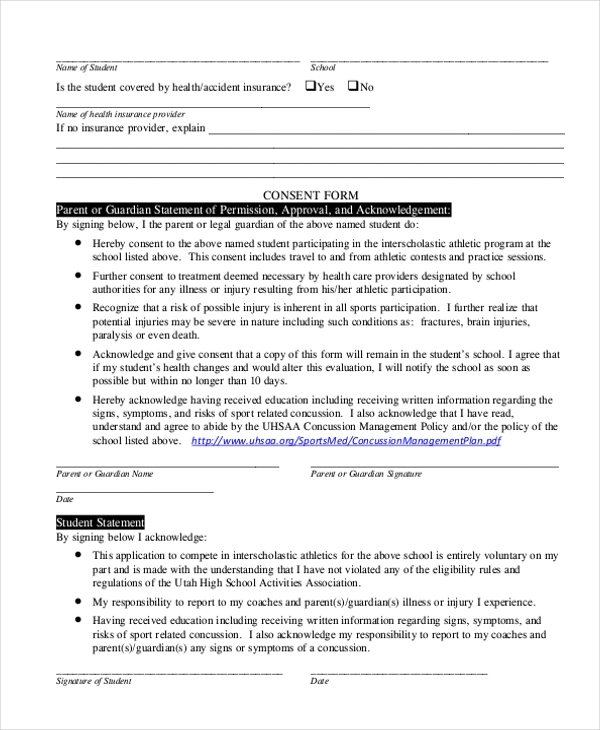 If you run a school and want your students to participate in a sports event, then this health physical examination form template can help you. Just download, print and distribute among students, so that they can fill it up and submit. 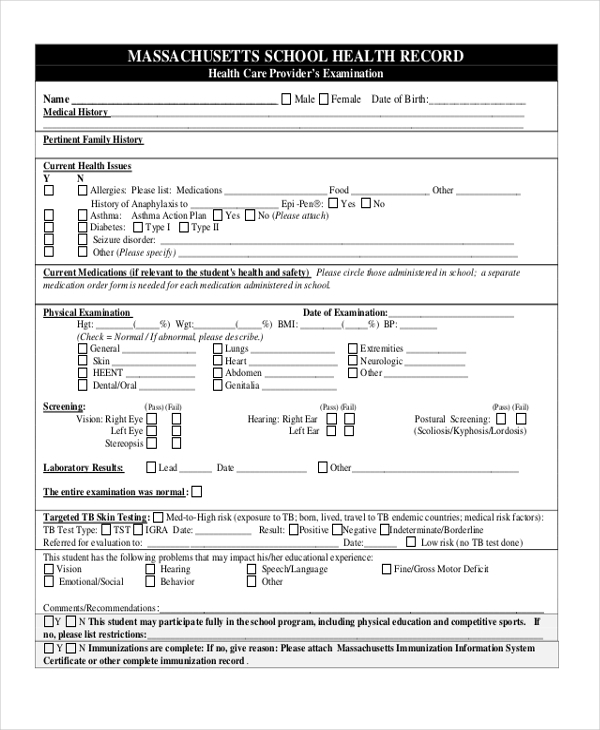 Any school can download this health examination record form template, for distributing the students, for getting health consent required for school event participation. Just customize, print and then use it. 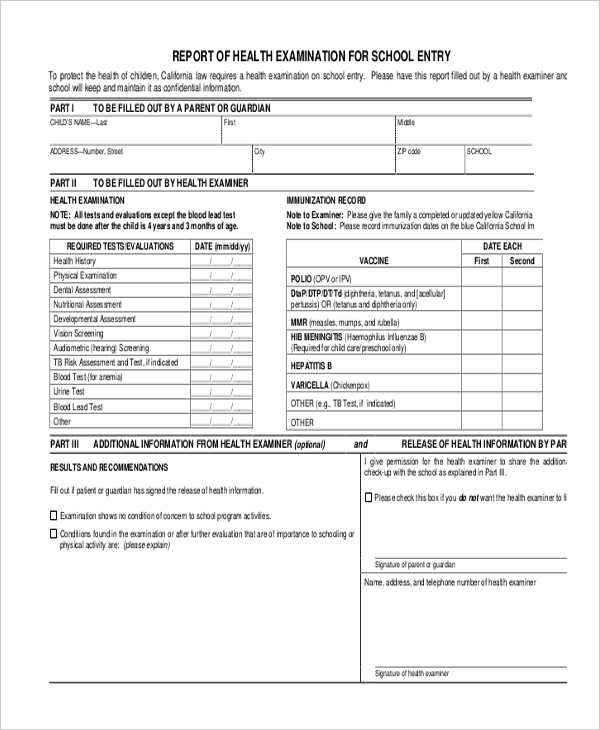 Before enrolling your child into school, you can submit his/her medical examination form, by downloading this certificate of the child health examination form template. Edit, print and fill it up. 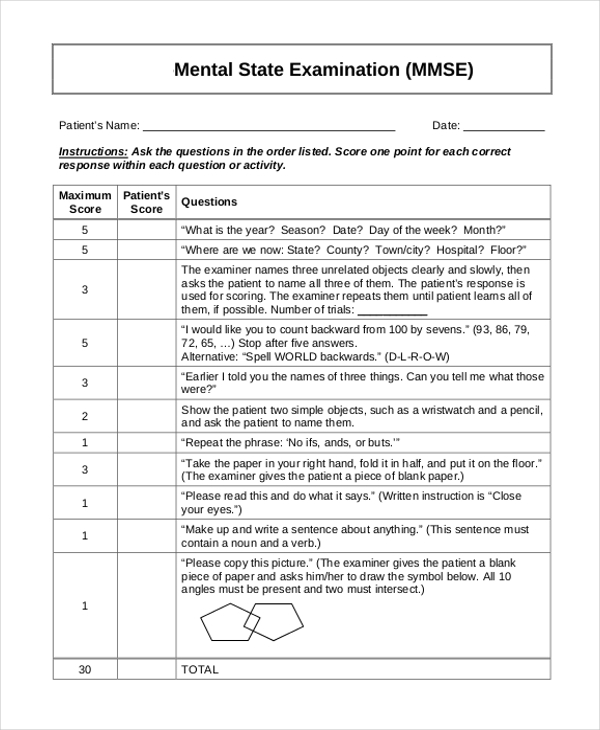 For accessing the mental health of a patient, this mental health examination form template can come very handy. Just download and customize it accordingly. Then print and use it in your chamber for use. For entering school, submitting a health examination certificate is a must. For that reason, you can download this health examination for school entry template and edit it accordingly. Then print it out for use. Before participating in any cultural or sports event of a school or institute, it becomes mandatory to submit health examination records. 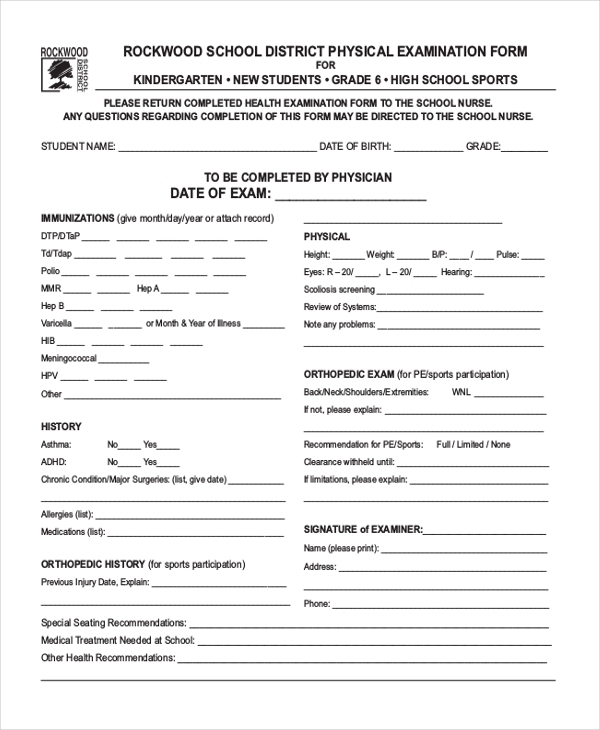 Download this pre-participation health examination form template, edit, print and distribute among students. 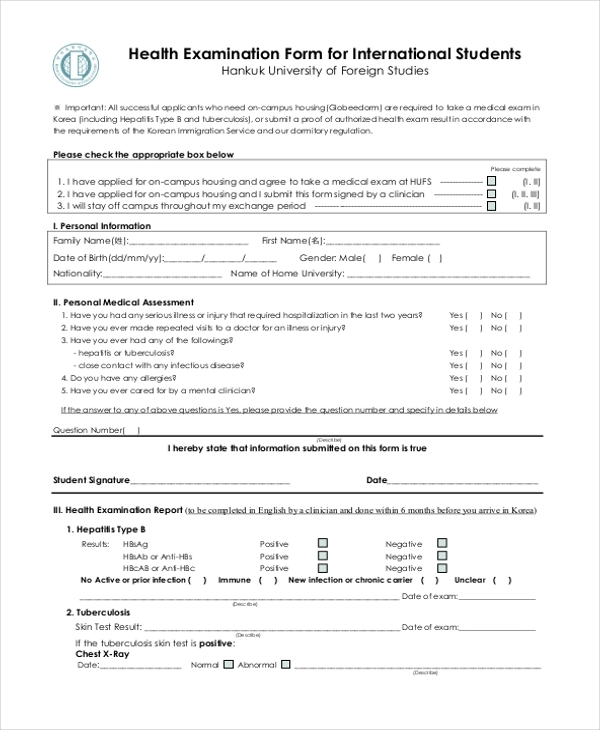 If the school you run also accepts international students, then downloading this health examination form for international students template is a must. Download, print and let them fill and submit for keeping health records. For keeping the health record in school, you can definitely download this child & adolescent health examination form template. Customize and edit accordingly and then print it out for delivering it to each child. If your school is arranging a camp for students, before that keeping their medical records is a must. 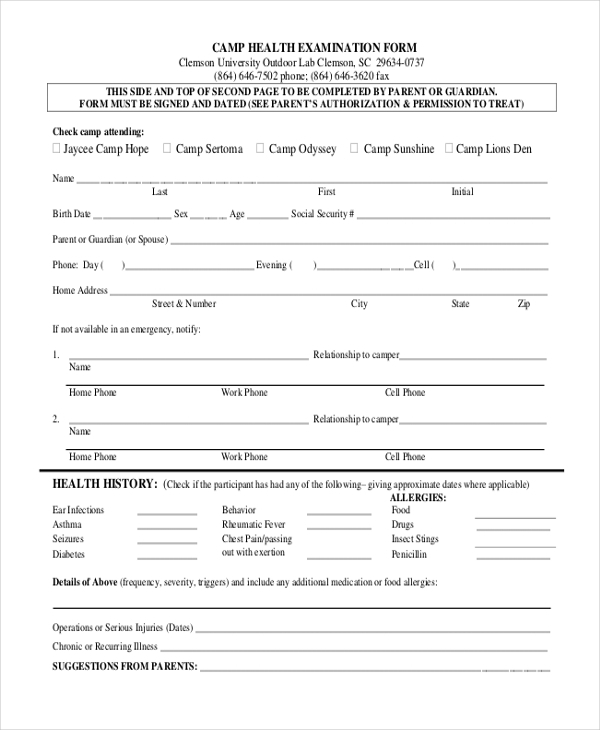 Download this camp health examination form template, to edit and print it. Give it to the students and let them fill up. No matter what you do, keeping your health examination records is a must. Whether your child is going to get admission in a school, you have applied for a job or whether as part of school authority, you need your students to take part in an event, all of these requires keeping medical records in the form of health examination forms. The templates in our collection have been designed and developed according to these form types. Anyone can download them and use these templates for their personal use. Instead of searching and creating these complicated forms, our collection in health examination form templates can be really useful. You may also see Dental Examination Forms. From schools, and institutions, offices and for anybody’s personal use, these health examination form templates are required. Keeping medical records is somewhat necessary and mandatory for each and everyone. These templates cover all the necessary heads, it does not only pose as a mere dental examination form but also helps you to keep records for entire health conditions. These templates are completely customizable. Editing is possible by replacing heads you think is not required in your case. These templates are also 100% print ready, you can take the printout in your preferred paper quality and use these forms yourself or use for the school or institute you run. 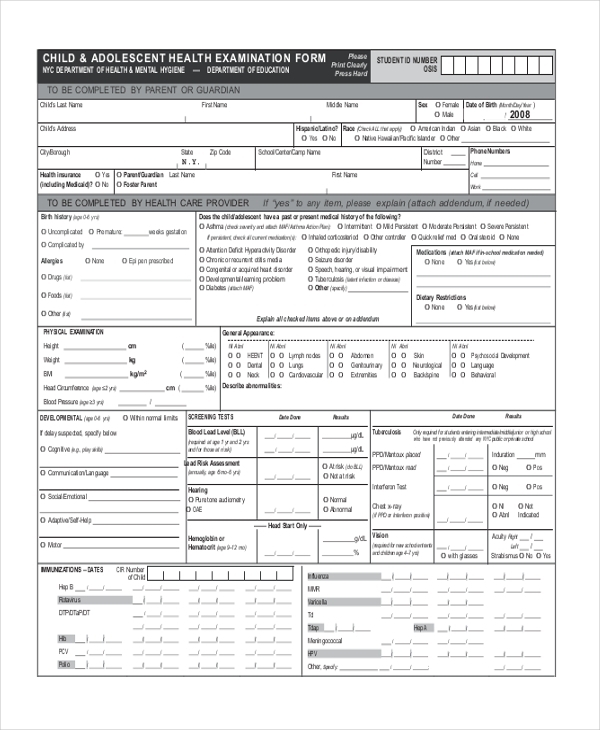 Health examination form templates are beneficial for everyone for a lot of reasons. One who runs a school or an institution will always like to keep the health report of its students, in order to be sure of them participating in any events or in the case of any medical emergency. Similarly, any company which hires employees for different posts will also require keeping their health reports in the form of health examination form, in order to avoid any kind of medical emergency or requirement. For any individual’s personal need also, they can download these templates, so that they can submit it anywhere they require. You can also see Physical Examination Forms. Browse through our collection of various health examination form templates available in Internal link anchor text format. The collection will definitely have takers from various backgrounds. The links are found as PDF format, which can be edited and used accordingly for various purposes, by different individuals for various types of cases.